John Kyle is a 61 year old GP and has been a Belfast City Councillor for just over 6 years. John talks about his love of cycling which gets him out for leisure and between his places of work..
I’ve cycled all my life, but more so the past 10 years since my knees decided they had had enough of jogging. I cycle partly for health reasons but I love the freedom cycling gives you, the sense of speed, the proximity to nature – you see so much more than when in a car. I really love the buzz I get from physical activity, and definitely love being able to bypass traffic jams. I do quite a lot of my cycling early in the morning, on the Comber Greenway or the Lagan Towpath but would also cycle to the City Hall when working as a Councillor. Cycling is my favoured mode of transport, but it can be difficult if I have patients to visit at home! I dislike strong headwinds but the payoff is usually a nice tailwind for the journey home. I will cycle unless it is raining heavily but I have had my fair share of soakings. 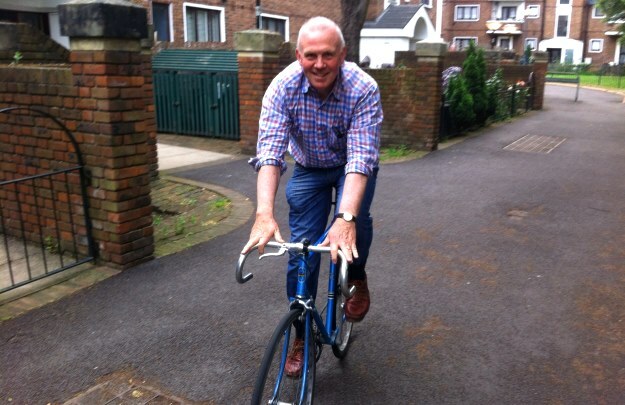 I ride a Ridgeback which I bought in the ‘Cycle to Work Scheme’ – it is a great bike. Three of my kids also cycle to work and for pleasure. I really enjoy using the Comber Greenway or cycling in the Gilnahirk hills. I dislike busy trunk roads with heavy and fast traffic and especially being overtaken by lorries. I have been knocked off my bike once and have had a couple of close shaves but no serious injuries. I find myself wearing more and more hi-viz gear. The stretch of road between the Albertbridge Road and Castlereagh St is tricky especially if you want to turn right onto the Woodstock or Castlereagh Roads, but DRD have made our roads much more cycle friendly with better road design and cycle lanes. I would love to see more green corridors like the Connswater Community Greenway or the Comber Greenway, they enhance our quality of life enormously. Also I think the proposed Gasworks Bridge over the Lagan is a brilliant idea, for many it will be a solution to the dangerous Albert Bridge bottleneck, and opening up Ormeau Park to city centre users. We have such great facilities in Belfast like the Greenways and also the Towpath and Loughshore Path. They’re all pathways shared between people cycling and walking. I do think cyclists need to show consideration to pedestrians and sound their bells to let pedestrians know they are coming. I think there’s a good argument that bells should be compulsory. There’s a few issues which have cropped up for cycling in Belfast recently. I am very concerned that the Cycle to Work Scheme is in danger of being undermined by preferential contracts eg between Belfast Health and Social Care Trust and Halfords. I fear this will seriously disadvantage local cycle retailers. I also hope for a favourable resolution to the taxis in bus lanes saga. It would also be a very retrograde step, deterring potential cyclists from cycling due to safety concerns.